Auburn Demographics: How diverse is it? Start now by Learning About Diversity at Auburn, and how it Compares to Other Schools in the U.S.. The total diversity grade is created by combining the results of ethnic, geographic, age and gender diversity. 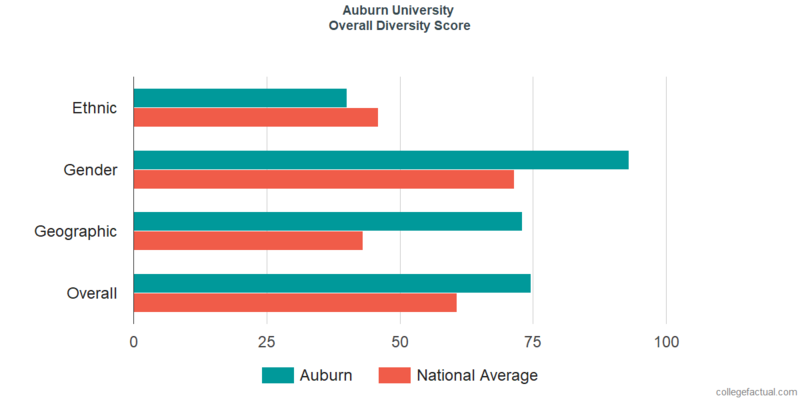 Auburn University is considered to be above average in overall diversity, and is ranked #520 nationwide. Many learners value the opportunity to meet and learn from others from different ethnic and racial backgrounds, unfortunately, that may be difficult at this school. Auburn University is ranked #1,942 in ethnic diversity nationwide with a student body composition that is below the national average. 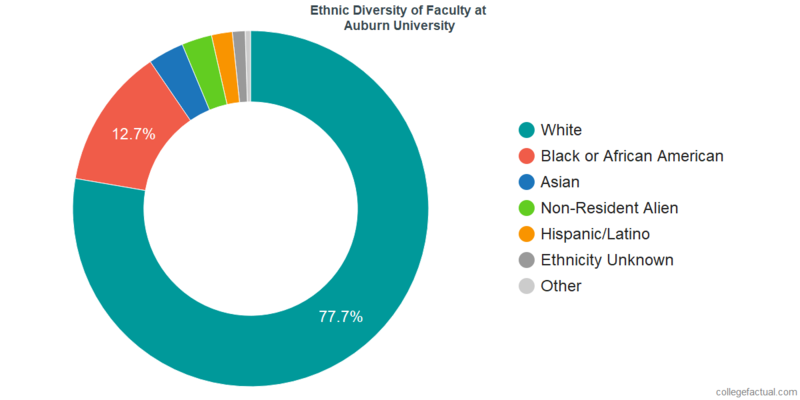 When available, the chart below will display ethnic diversity among the undergraduate students at Auburn. Auburn's ethnic diversity is below the national average. If you feel more comfortable on a campus with a nice mix of males and females, this may be the school for you. At Auburn University, the disparity between men and women on campus is far lower than the national average. The undergraduate student body at Auburn is equally balanced. This university is ranked at #95 in male to female diversity nationwide. The undergraduate population is comprised of 11,613 males and 11,045 females. If available, the chart below will include the male to female ratio among Auburn's undergraduate students. The male to female ratio at Auburn is excellent. If available, the chart below will include the male to female ratio among Auburn's faculty. The ratio of male to female faculty at Auburn is excellent. We took a look at where each of the school's admitted students lived before attending in order to come up with the geographic diversity grade. 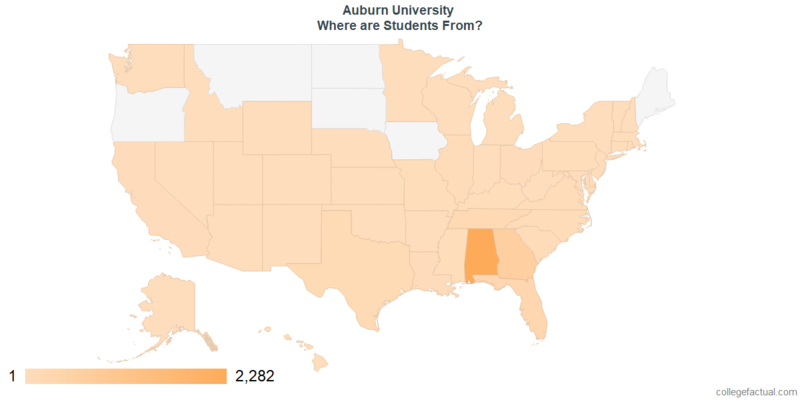 About 60.4% of the students attending Auburn University come from within Alabama. Auburn's rating of #452 makes it above average in this factor. The undergraduate student body is split among 39 states (may include Washington D.C.), as shown in the chart below. There is a mid sized group of about 2,235 international students at Auburn University representing at least 46 countries. Go to the Auburn International Student Page for more information. Some learners prefer a campus filled with others who are a similar age to them, while some prefer a wide age range of students. Which is best for you? The "traditional" college student is thought to be between the ages of 18-21. At Auburn University, 61.4% of students are in the age 18 to 21 bracket, compared to the national average of 60%. We rank Auburn #2,067 in the nation for student age diversity. Analyze the age range of Auburn students with the following chart. What do we mean when we refer to diversity in college? Broadly speaking, diversity is the word we use to describe a mixture of individuals and ideas, and the traditions, belief cultures and systems that come with them. When most students seek diversity on a college campus, what they are looking for are opportunities to express themselves and find community with others who believe the same way, as well as opportunities to learn from those from different backgrounds and cultures. Is Auburn supporting learners from all backgrounds? Schools with otherwise excellent ethnic and location diversity still may not be diverse when it comes to other factors, such as income levels. Get a better idea of how Auburn supports low-income students by visiting the Financial Aid Page. Is Diversity Important to Auburn? Contact the school to find out what they are doing to stimulate diversity, and what student groups, associations and clubs are available that encourage diversified points of views on campus.